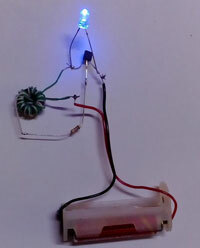 You can turn on a 3 Volt LED just using 1.5V Battery. It is the Joule thief circuit doing the trick. Joule thief circuit is a self oscillating voltage booster used to drive light loads like LED. The name Joule thief is given to the circuit because; it is stealing the Joule or energy from the battery. That means, it is extracting energy even from an almost dead battery to power a load. Try it. This is one basic circuit you should know as a starter in electronics.